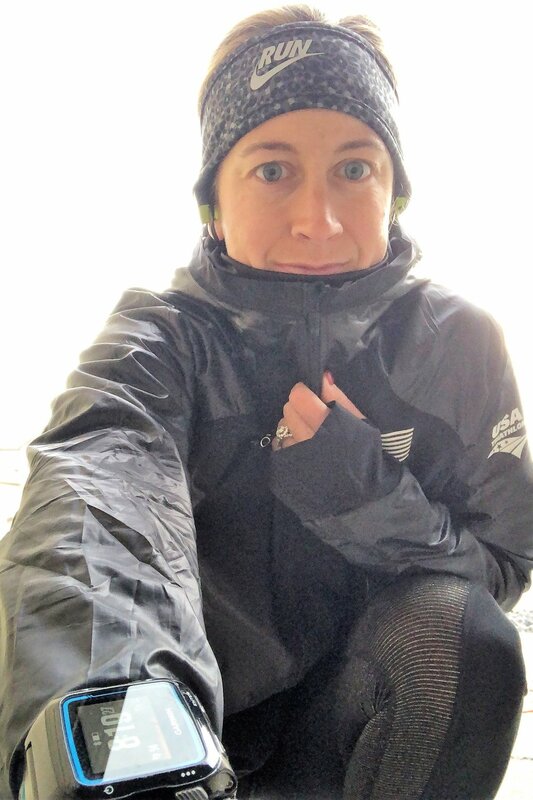 I will be the first to admit that in the cold, rainy, and winter-y months I am a huge baby when it comes to running in the elements; I am a fair-weather runner and especially a fair-weather biker. In the Pacific Northwest if you can’t man up and head outside you will spend an awful lot of time indoors on the trainer and/or the treadmill, this can result in going slightly stir crazy. While I personally will not head out on the bike, mostly because I don’t have the proper type of bike to do so in the winter, there are times I will head outside into the elements to run in most conditions, depending on my motivation and they type of workout I have to do. The age-old saying is there is no such thing as bad weather only bad preparation, or something like that. This is very true for the shoes you wear, number of layers, and type of material you pick for your clothing. Make sure that you keep your exposed skin as covered as you can, this will help prevent areas from being cold and any frostbite or frozen skin as possible. Number of layers - More often than not people wear too many layers when they start out their run because you start out the run really cold, then all of the sudden they’ve been running for twenty minutes and they are totally overheating. I am a culprit of this, more often than not I get twenty minutes into my run and I am so hot that I am uncomfortable and sweating way more than I need to be. The key is to choose the layers as if it was 10-15 degrees warmer than it is, for me I find the key is to choose one less layer than I actually think that I need. Shoes – there isn’t much when it comes to shoes besides choosing a running shoe with a good grip to decrease the risk of slipping. It is hard to totally prevent your feet from getting wet however if you spray the shoe with waterproof protective spray it can really help. Accessories – gloves, hats or ear covers, even face masks or neck gator. One of the biggest complaints of running in the cold, not so much the rain, is that it hurts to breath. Most of us are mouth breathers when we run as it is the fastest way for us to get oxygen to our lungs. Because this is the fastest way the cold often chokes up our airways and our chest as we are just breathing in cold air. Breathing through your nose it takes a little longer for air to reach your lungs and as it travels through your nasal passages and trachea it is warmed before it hits your chest. Misery loves company and if you are going to be miserably wet or cold might as well be wet and cold together. 😊 In all seriousness though, running with others especially when the weather creates low motivation is a great way to keep yourself accountable and help with motivation. Even when it is cold you are still going to sweat a fair amount, in fact you may sweat more because you are wearing more layers than you do in the heat and don’t have the air to evaporate the sweat as you run. If you are running into the wind towards the end of your run this will make you seem colder than you are. If you can start your run into the wind that means it’ll be at your back as you come home, and you won’t feel as cold, plus it makes the way back easier and faster. Just because it is cold outside does not mean you can skip your standard fueling practices, both with calories and water. You forget that you are still burning calories and still sweating the same amount even though it is cold out. Your body still needs the same number of calories and hydration that it does when it is warm out. When fueling make sure that you are getting around 20-24 oz of fluid every hour and around 100-200 calories every hour as well, noting that this is extremely dependent on you as a person, make sure that you perform the proper sweat testing and fueling testing in order to determine how many ounces of fluid and calories you need to consume per hour. If you still don’t know what to wear here is a “what to wear” guide from Runners World that is really helpful. Running outside in the elements doesn’t have to be totally miserable, and it is a great option rather than staying indoors throughout the entire winter months. I hope these tips help to motivate you to get outdoors a few times this winter, soak up the fresh air, and run out the willies of the winter.